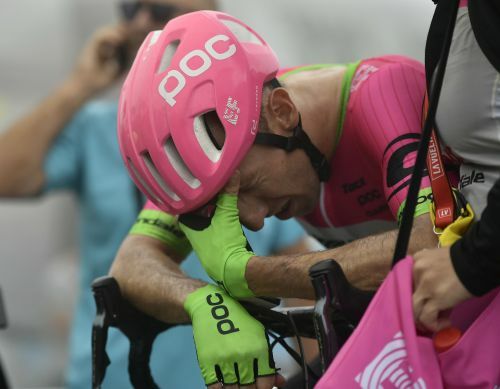 BALCON DE BIZKAIA, Spain (AP) — Simon Yates lost a few seconds of his Spanish Vuelta lead on Wednesday, while Michael Woods of Canada earned an emotional victory on a difficult mountain stage. Woods outlasted the field in a 157-kilometer (97.5-mile) 17th stage that finished with a tough climb up Balcon de Bizkaia in Basque Country, and then dedicated the win to his stillborn son, who died this year when his wife was 37 weeks pregnant. The Canadian rider crossed the line five seconds in front of Dylan Teuns and 10 seconds ahead of David de la Cruz. "It's a special moment for me. I was very moved on the finish line," the 31-year-old Woods said. "My coach was in the car and in the final 500 meters (yards) he told me on the radio to think about my family." Woods said that his wife also lost her father a month ago. "It's been a very hard year," he said. "I was cracked on the finish line. I tried to stay calm, I tried to think of my family and to think of my little Hunter as an inspiration." This was the first stage win at a Grand Tour race for the rider from team Education First-Drapac. Yates' gap to Alejandro Valverde was cut from 33 seconds to 25 seconds after a solid climb by the veteran Spaniard. Enric Mas also had a good run and moved up to third place overall, 1 minute, 22 seconds behind Yates. "There's still a lot of racing to come, hard stages ahead. The gaps are still small behind me," Yates said. "Nobody really attacked in the climb. There's no shame in losing a few seconds to Valverde and Mas in such a finale. I truly believe Andorran stages are much better for me. Of the stages left, this is the one I feared most. I know Andorra very well and I think the climbs suit me very well." Nairo Quintana struggled the most, losing more than a minute and dropping out of the top 5 in the general classification. No changes at the top are expected on Thursday, when riders will face a flat 186.1-kilometer (115.6-mile) stage from Ejea de los Caballeros to Lleida in northeastern Spain. The three-week Grand Tour race ends Sunday in Madrid.